When we purchased this house in 2009, the two-story structure was in need of an overhaul. Gutting and rebuilding it entirely over the course of 2 years, we used the careful thinking of two highly visual middle-aged women: providing an entertaining gallery/music room, a high-ceiling front porch with a great street view, a mosaic tile side-entrance, and each room filled with custom-built furniture and fine art. 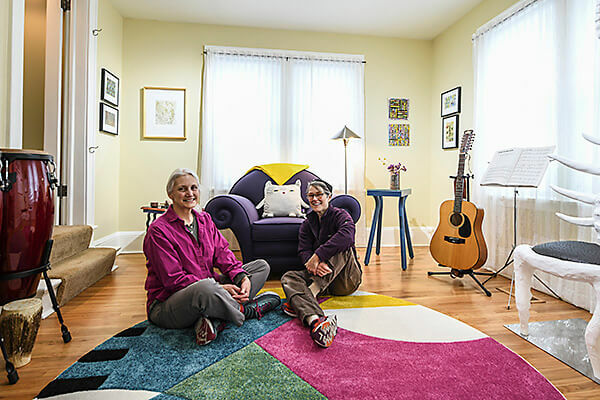 Dubbed “The Two Muses’ Guest House,” it has been listed on Airbnb and VRBO for the past few years, hosting folks from all parts of the globe. Guests revel in the warmth and coziness of the home in all seasons, leaving online reviews that speak volumes of the warmth, charm and sense of humor imbued within.